According to the World Health Organization, 1 in 4 people will experience a mental or neurological disorder at some point in their life. Additionally, mental health-related issues prevail as the leading cause of poor health and disability across the globe, impacting more than 450 million people. Clearly, there is an imminent need for widespread mental health services- across the globe. This need introduces an opportunity for the digital health world to design technologies for mental health and therapies. Many people do not realize how difficult it is to find the right mental health professional. In her piece “How to Find the Right Therapist”, New York Times author Marissa Miller explains that seeking out a therapist is like “dating”, and that a fabulous therapist for one individual is not effective match for another individual. Miller recounts her process of asking for recommendations from friends, only to find that her friend’s recommendations did not suit her needs. Miller explains that it took her three years to find the correct mental health professional for herself. What if technology could be used to increase the speed and efficacy of therapist matching to help people like Miller? Lyra Health does just that. Headquartered in Burlingame, California, Lyra Health uses a digital match-making process to match individuals to the right kind of treatment, and the correct professional for their specific needs. 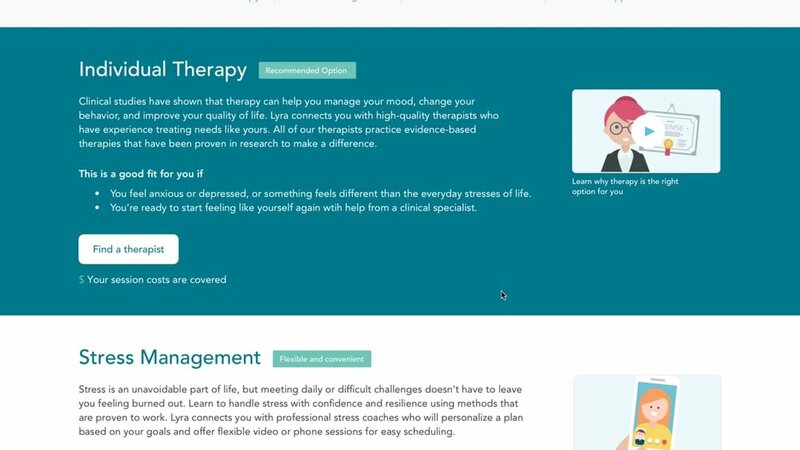 We spoke with Amelia Gilbert, Director of Partnerships at Lyra Health, to understand how Lyra is using technology to increase the efficacy of mental health care. Junto Health (JH): What inspired you to create Lyra? How did you decide upon the name? Amelia Gilbert (AG): Lyra was founded by David Ebersman in 2015, previously serving as Chief Financial Officer at Facebook and Genentech. He was inspired to create Lyra after a long struggle to find high-quality mental health support for a family member who needed help. Despite living in one of the highest concentrations of therapists on the planet, he spent endless hours, over years, searching for care that could help. The process left him frustrated and dejected. When he finally found help for this loved one, it was life-changing. That’s why he started Lyra: to make it possible and convenient for everyone to access the kind of care that can forever change their life. Our name was inspired by the constellation Lyra. One of the brightest formations in the night sky, Lyra helped ancient seafarers find their way home. Lyra (the company) similarly helps people navigate the hard-to-traverse world of behavioral health. We know it sounds cheesy, but we aspire to shine brightly so people can find their way to emotional health and wellbeing. JH: How does Lyra work from the perspective of the user? What is unique about the matching process that you use? What is the success rate of your initial pairings? AG: Lyra partners with employers to bring high-quality, evidence-based care to their workforce and benefits-eligible dependents. A member would visit our digital platform, take a brief assessment, and receive provider recommendations personalized to their specific needs. The member can schedule directly with a therapist online, and all surfaced providers have confirmed availability within the next two weeks. Our concierge care team in on standby 24/7/365 to support anyone who needs immediate support or has a highly-specialized need. Lyra’s proprietary matching algorithm allows us to effectively triage patients to providers who have with the experience and expertise they need to feel better. Using this data-driven approach, we have been able to achieve very high therapeutic alliance: 95% of Lyra members stick with the first therapist they meet. JH: What type of therapy is provided through Lyra? AG: Lyra delivers therapy to individuals, couples, and families. We have specialists who treat children and adolescents, support acute needs like substance abuse and self-harm, as well as countless other areas of expertise. Lyra only works with providers who practice evidence-based approaches and collect clinical outcomes. Evidence-based therapies are those that are rooted in scientific evidence and have been proven effective in clinical trials. They are usually short-term (8 to 16 sessions) and use methodologically-sound assessment measures, like the PHQ-9 for depression or the GAD-7 for anxiety. They often involve “homework” outside of session and focus on skill-building rather than insight or catharsis. The American Psychological Association has a directory of evidence-based treatments that can be viewed here: https://www.div12.org/treatments/. JH: Can you explain the concept of EAP, and how Lyra is revolutionizing it? AG: An employee assistance program (EAP) is a employer-sponsored benefit designed to help employees resolve issues that keep them from performing in their jobs, including mental/emotional health issues, substance abuse, etc. Traditional EAPs have been underutilized due to low awareness, difficulties getting an appointment with a qualified therapist, and low session limits (typically 3, 5, or 8 sessions) that send them right back to the health plan when an issue isn’t resolved. These barriers often prevent employees from getting the help and support they desperately need. Lyra has reimagined the EAP by removing the barriers to accessing high-quality, evidence-based care. We built our own network of the most elite providers across the country. We have a suite of preventative offerings, including stress management and relationship coaching, and self-care apps. Finally, we deliver all of this through our digital platform that enables members to quickly register, take a brief assessment, receive personalized recommendations, and schedule with confirmed-available providers right online. From beginning to end, the process takes just 5 minutes. Our average time to first appointment is only 8 days, compared with 21-30 days with a traditional EAP. All of our providers collect clinical outcomes, so our partner companies know that not only are their members getting help, but they’re getting better. 67% of Lyra patients either see reliable clinical improvement or recover (become sub-clinical) by the end of treatment. JH: From your perspective, what are the primary issues with current counseling and therapy systems that employers provide their employees? How is Lyra addressing these issues? AG: The primary issues are: 1) difficulty accessing care, 2) questionable quality of the care being received, and 3) lack of accountability of delivering positive health outcomes. Access - Lyra is addressing the access issue in two key ways. First, we make getting access to care easy with the Lyra digital platform, which is supported by a team of master’s-level clinical specialists who are available 24/7/365 to help members with acute or specialized needs. Our availability verification process ensures we only recommend providers who are accepting new patients. Second, we partner with companies to craft creative marketing campaigns to combat shame and ensure high awareness of this competitive benefit. Quality - With Lyra, members can rest assured that we have done the quality curation for them. We have built our network using a mathematical, data-driven approach that ensures we only work with the highest-quality providers. We started by building the largest database of mental health providers in the country - some 400,000+ professionals - using data from 32 different sources to score each provider on their adherence to evidence-based treatments. Providers who wish to join our network are selected based on their use of evidence-based treatments and go through a live clinical vetting process. Only those who meet our rigorous quality standards are onboarded into our network, which is currently about 3,000 providers nationwide. We don’t stop there - our network curation team works tirelessly to address any quality issues that arise by providing professional development opportunities to a struggling provider, or in some cases, curating them out of the Lyra network entirely. Outcomes - All Lyra providers agree to collect clinical outcomes throughout treatment. With a traditional EAP, no outcomes are collected and employers are left without data to support their investment in mental health (or to even understand what they’re paying for). Across our book-of-business, 67% of Lyra patients either see reliable clinical improvement or recover by the end of treatment (an average of 11 sessions). With our stress management coaching program, 85% of participants have reported a significant decrease in their stress, with a self-reported 20% increase in productivity. JH: In terms of your business model, why did you decide to target employers as customers, instead of working directly with individuals? AG: In the United States, healthcare is most often sponsored by a person’s employer. Lyra’s goal isn’t just to affect change on the margins, but to change the system by which people access mental health services. We believe we can do that most boldly by partnering with employers, who have a shared interest in a healthy, engaged workforce. JH: How many users do you have? What companies are currently using Lyra for their employees? AG: In 2019 over half a million people across the U.S. will have access to Lyra. Our customers include Lyft, eBay, Uber, Amgen, and ServiceNow. JH: What has the feedback been from Lyra users and therapists regarding its efficacy? AG: Based on clinical outcomes, 67% of Lyra patients either see reliable clinical improvement or recover. Lyra providers deliver clinical outcomes similar to those seen in controlled clinical trials. Lyra measures patient satisfaction on a 1 to 5 star scale. To date, 94% of patients are highly satisfied with their Lyra experience. Our NPS (Net Promoter Score) for providers in our network that have seen a Lyra patient is 75. JH: What are 3 milestones you are hoping to achieve in 2019?